"About midway between Port Elizabeth and the point where the Menantico Creek empties into the Maurice River was a very early ferry…" wrote Charles Boyer in his book Old Inns and Taverns in West Jersey (1962). The exact point has long been called Spring Garden Ferry. In 1792, Uriah and Rebecca Mayhew signed a deed and took ownership of a tract of land on the western shore of the Maurice River. According to the information documented on the Cumberland County Historical Sites Register, the Mayhews "were well established in the area by 1799." At some time during the years between 1792 and 1799, they built a home. (An exact date is not listed.) 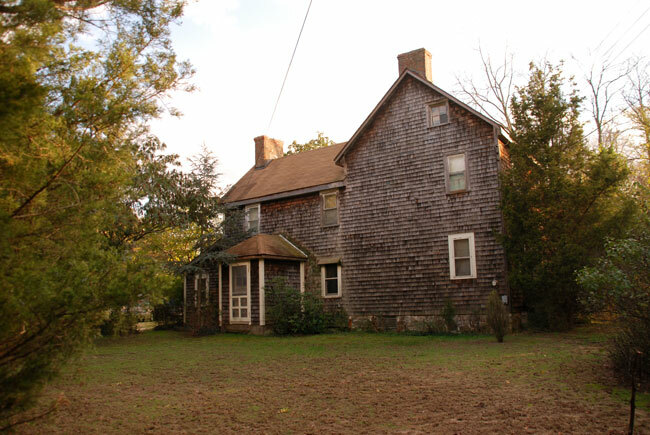 Cumberland County historical records show that this house, "a typical South Jersey farmhouse for the era," was home for the Mayhew family "until the Spring Garden Ferry crossed the river at this point." The Mayhew name stays embedded in the area's history. In the 1876 Atlas of Cumberland County, an unnamed road leads through Commercial Township toward the western shore of the Maurice River. On that map, on either side of that road near the river's edge, are tracts of land owned by Mrs. M. Mayhew and Mrs. E. Mayhew. There is evidence that, shortly after the turn of the century, this site played a vital role in the history of transportation along the Maurice River. According to the earliest records, Peter Hoffman brought his family to the western shores of the Maurice River in the early 1700's. A 1745 map in the Cumberland County Historical Society also shows that just a bit north of the Hoffman property, a small log structure was constructed and served as what has traditionally been called the Old Swede's Church. 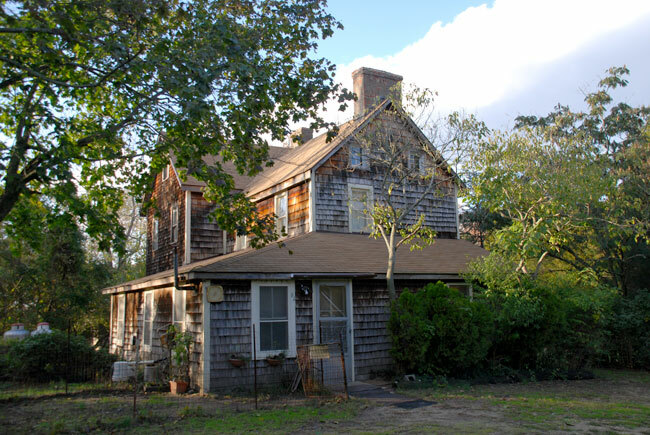 Charles Boyer wrote that it became "an important ferrying place on the old road from the Cape May district to Greenwich Town." Historian Herbert W. Vanaman agreed, suggesting that "the most important ferry over the Maurice River was at a place called Spring Garden." In his article, "Some Historical Notes Concerning the Maurice River" (Vineland Historical Magazine, January-April 1965), Vanaman wrote that this ferry was "put into operation by Abraham Reeves, one of the very early land holders in the Maurice River area. The ferry was run by Abraham's brother, Henry and his wife Hannah. The business was later sold to Abraham's daughter, Anna Eliza, wife of Clement Lee. The property was later sold to John Fries, who was operating the enterprise as late as 1875." Vanaman noted that origin of the name Spring Garden "is buried deep in the mists of the past." What we do know is that the name Spring Garden predates the Philadelphia neighborhood with the same name. Philadelphia's Spring Garden district was incorporated March 22, 1813. By 1810, the Spring Garden Ferry was well established. One of the Cumberland County Historical Society's early maps indicates that John Elkinton, Esq., had the property surveyed for a business endeavor. There is another important documentation of Elkinton business transactions. On May 12, 1813, an application of Joe Elkinton: rates of ferriage at Spring Garden Ferry were fixed as follows: "Four horse wagons and load 37 1/2 cents, 2 horses 25 cents, horse and sulky, chair bar wagon 19 cents, horse and rider 12 1/2 cents, every adorned horse 6 1/4 cents, every horned creature 6 1/4 cents, foot person 6 1/4 cents, half dozen sheep or calves or less 12 1/2 cents by the County Board of Freeholders (See minutes of the board).” The anonymous researcher of these records also noted that the rates "were reduced May 9, 1821. On May 8, 1822 rates were raised but not to the old standard." Boyer's book reveals that "while it is certain that an early tavern had been opened on the east side of the river at Spring Garden Ferry, the first landlord who can be identified with it is John Gifford, who was licensed in June 1813. Daniel Vanneman [spelled this way by author], William Tonkins, Maurice Carter and Ezekiel Shaw were later taverners." In his book, Maurice River Town, historian Herbert W. Vanaman wrote that a hotel, the Spring Garden Ferry House, was opened in June 1813 by John Gifford. Daniel Vanaman took ownership in 1817. During the next decade the hotel was not always open for business. It went through a series of owners. Vanaman noted that in 1829 Ezekiel Shaw may have been the last hotelier at the site. In an informal talk given at the Vineland Historical Society, March 9, 1936 (notes on the presentation recorded and archived), local historian Philip Nutt provided some colorful details about the operations of Spring Garden Ferry in the early 1800's. "The opposite side of the river came out to a long point from Buckshutem and people coming from the west would come down by the old saw mill at Buckshutem." Nutt said that if the boat was on the other side of the river, waiting passengers could signal for service: "There was a pole with a bell on it, so you would ring the bell and they would come after you. It was a flat bottomed boat that you could drive a team and a wagon on and they would pole you across." The importance of this Maurice River crossing is described in a handwritten account of Clarence Pettit, dated August 1887: "Port Elizabeth was once the chief market for the people of the surrounding country [author's word] to dispose of their products as it was in more direct communication with Philadelphia. Consequently produce from this side of the river was carted for miles around down the Spring Garden Road - at the terminus of which was a ferry - to be ferried across to market." A recent exhibit at the Lummis Library, "Cumberland County Ferries," provided some other interesting details: The Spring Garden Ferry - and the one at Mauricetown (to Port Elizabeth) -ceased operations by 1880's when a bridge was built at Mauricetown. A copy of a photo, "Remains of Ferry Boats at Spring Garden," showed a muddy shore littered with fragmented hulls, planks, and other remnants of a forgotten era. Long-time resident Everett Turner has seen other signs of that era. Turner related that "in extremely low tides, on the far side, they used to farm that meadow. Right down at water level there was an old hay rig that sat there for years and years. And there was a crossing there."